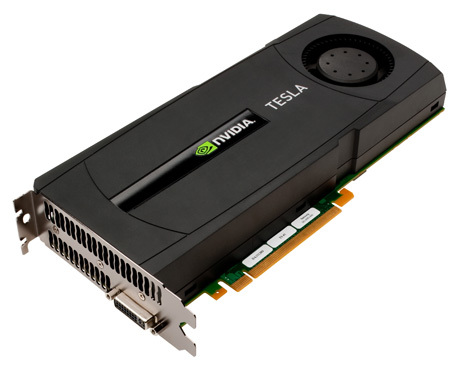 The Tesla GPU from NVIDIA. The Dsg cluster at Fermilab. The 10g cluster at Jefferson Lab. 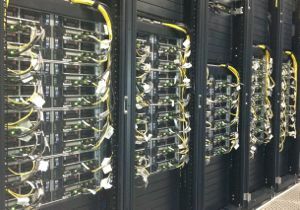 Dsg, the latest cluster built at FNAL, (upper left) consists of 76 nodes, each with 2.53 GHz dual CPU eight core Intel Xeon ("Westmere") conventional processors, two NVidia M2050 GPU processors, and a QDR fabric. It has a throughput of over 8 TF, depending on the task. The latest GPU-accelerated cluster at JLab is 10g (lower left). 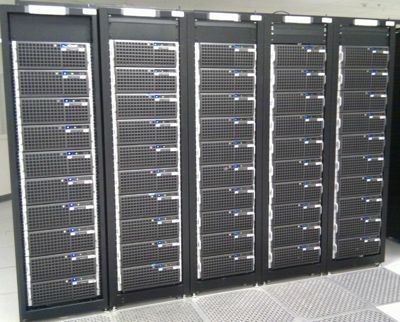 This cluster consists of 32 host systems, each containing 4 NVIDIA Tesla C2050 GPUs with 3 GBytes of memory per GPU, and 20 host systems, each containing 4 GTX-480 GPUs with 1.5 GBytes of memory per GPU, for a total of 128 Tesla and 80 GTX-480 GPUs. The 10g host systems are dual socket, quad core 2.53 GHz Intel Westmere computers with 48 GBytes of host memory. The hosts are interconnected with either single-data-rate (GTX-480 GPUs) or quad-data-rate (Tesla C2050 GPUs) Infiniband. Members of USQCD employed directly by the NVIDIA Corporation are working in collaboration with academic members of USQCD to optimize code for Titan, the GPU-based supercomputer at the Oak Ridge Leadership Computing Facility.